"The Dark Lord said you would come! This is where you journey ends...boy. Trapped and freezing at the roof of the world, with only death to sing the tale of your doom!" The Nathrezim, known as dreadlords, are among the most devious and intelligent lieutenants of the Burning Legion. Their vampiric motivations lead them to siphon energy from the living and employ their dark influences upon allied nations, turning them into bitter enemies. Few dreadlords were as cunning as Mal’Ganis, whose machinations would lead Arthas Menethil down the path of despair, hatred, and paranoia to become the Lich King and ultimately change the course of Azeroth’s history forever. Mal’Ganis is a sturdy warrior with moderate damage and consistent self-sustain. 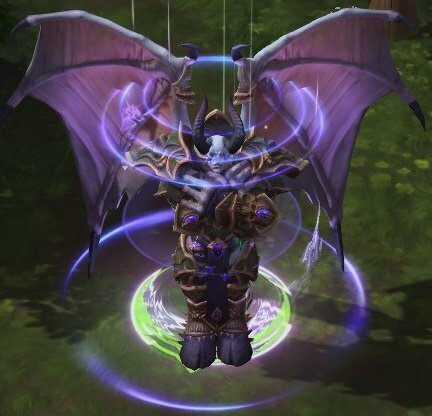 Much like Illidan and Malthael, Mal’Ganis benefits from (or relies on) sustained combat with multiple enemies, draining their life to heal himself. He has the tools necessary to operate as a functional off-tank/solo laner, but his ability to function in the main tank role seems limited. Today we will be digging into the first and long-awaited dreadlord to enter the Nexus. The observations to follow will serve as initial impressions of the hero, and may adjust over time going into his release. Mal’Ganis has a base health pool of 2809, comparable to tanks like Muradin and Arthas. While his damage output isn’t particularly impactful (75 damage per Q swipe), the constant healing from his AoE damage is enough to make him one of the more sustainable teamfight warriors in the game. His lane sustain is decent, with a wave returning roughly 20% of his health, increasing if attacking an enemy hero. 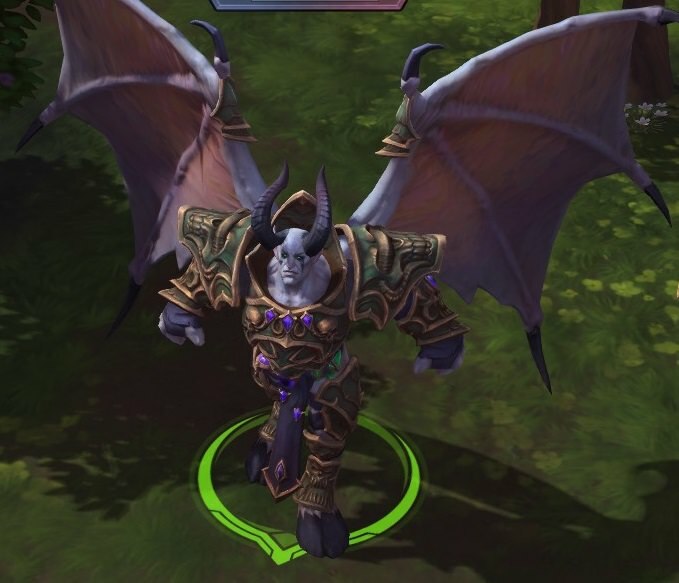 Unlike Yrel and Blaze who do not require hero or minion interaction to heal, Mal’Ganis is limited to combat healing which may impact his lane rotations if against one of those two in the solo lane. Another weakness to Vampiric Touch comes in the form of healing reduction abilities/talents such as Deckard’s Emerald, Malthael’s Touch of Death, or Ana’s Biotic Grenade. An insightful player will look for when Mal’Ganis is most desperate for healing and time their abilities accordingly. Violently slash in the chosen direction, dealing 75 damage to enemies. Lashing out up to three times with a range and area of effect similar to Greymane’s Razor Swipe, Fel Claws is a triple threat ability with sustained damage, self-healing (trait), and reliable CC. Each cast of Fel Claws initiates a three second window to cast it again. The third swipe will knock up enemies much like [i}Groundbreaker[/i] and Burrow Charge and is quite punishing to the enemy frontline. It is important to note that the eight second cooldown begins on the first swipe, so it is possible to space out Fel Claws swipes to fit the situation. While a stun or silence won’t stop the secondary casting window, it may deny you the opportunity to cast again depending on the duration of the CC. Fel Claws is the bread and butter of Mal’Ganis’s kit. Seasoned users will optimize the timings of each swipe for optimal effect, while keen opponents will look to lock Mal’Ganis down at the appropriate moment. Desecrate the air, dealing 114 damage to nearby enemies and gaining 25 armor for 3 seconds. Necrotic Embrace is provides moderate AoE damage, 25 armor on a short cooldown, and a handful of early game talents which provide meaningful adaptability. When initiating, Mal’Ganis players may look to open with Night Rush(E), position in the middle of the team for a high value Necrotic Embrace, and finish with Fel Claws. It looks cool, sounds cool, and makes Mal’Ganis feel impactful as an off tank. After 0.75 seconds, gain 50% Movement Speed for 2 seconds. While activated, Mal’Ganis can move through enemy Heroes and put them to Sleep for 2.5 seconds. Night Rush, unlike Fel Claws, will get interrupted by CC. That aside, the ability provides Mal’Ganis with both a threatening engage and CC tool, along with a repositioning ability during the middle or at the end of a teamfight. The 50% movement speed increase is helpful for chasing down fleeing enemies, peeling for the backline, or making an escape. It may be tough for melee stuns to interrupt this ability without risking Sleep and the bonus movement speed may make it tough for ranged stuns from lesser skilled players. After 1 second, disperse into an Invulnerable swarm of bats for 3 seconds, dealing 289 damage per second to enemies. Vampiric Touch heals for 100% of Carrion Swarm’s damage to Heroes. Both of Mal’Ganis’s heroic options are powerful in their own right. From initial play tests, it seems like Carrion Swarm will see the most use in coordinated play as it provides ridiculous healing in a teamfight, much like Ardent Defender. Dark Conversion has a very short cast range but can be very powerful in the right circumstances. The obvious benefits come from taking down a high health tank like Cho’Gall or Diablo, but the very nature of this ability banks on altering expected outcomes for the enemy team. Mal’Ganis can pop Dark Conversion as he is being focused down or cast it right before intentionally soaking massive damage. Much like the Life-Binder of old, it may be too conditional for consistent use, but the playmaking potential is certainly there. Hover over icons to read descriptions. When Necrotic Embrace expires, it explodes again for 50 damage. If an enemy Hero is hit, Mal'Ganis retains 25 Armor for 1 more second. Does not wake Sleeping targets. After 1 second, disperse into an Invulnerable swarm of bats for 3 seconds, dealing 132 damage per second to enemies. Vampiric Touch heals for 100% of Carrion Swarm's damage to Heroes. Basic Attacks against Heroes with a higher Health percentage grant 40% Attack Speed and 10% increased Physical Damage for 3 seconds. While Necrotic Embrace is active, Mal'Ganis heals for 12 when damage is taken and Vampiric Touch converts 15% more Hero damage into healing. Activate to erupt with blind rage, removing the cooldown and Mana cost of Fel Claws but losing all vision. Lasts 6 seconds. 80 second cooldown. Each time Necrotic Embrace hits an enemy Hero, gain 50 Physical Armor against the next enemy Hero Basic Attack. If Winged Guard has no charges, Mal'Ganis will gain 1 charge after 6 seconds. Winged Guard is very potent both in the solo lane and teamfighting. The tooltip does not mention it, but the talent maxes out at 10 stacks of block, making it very easy to gain value from when in the middle of a teamfight. Vampiric Aura feels much weaker in comparison to Time to Feed which will greatly increase the healing value of Fel Claws. Vampiric Aura will rely on Black Claws at Level 7, Frenzied Assault at Level 16, and Vanquish the Weak at Level 20 to gain the most value. Each Level 4 talent offers meaningful adaptations for Necrotic Embrace. Fueled by Torment enhances Vampiric Touch healing even further and provides counterplay to sustained auto-attackers like Tracer. Might of Sargeras buffs the armor gain to 50%, giving Mal’Ganis survivability against burst and single target focus. Echo of Doom adds more damage and extends the armor duration, gaining value on sustained team fight maps like Volskaya Foundry, Infernal Shrines, or Braxis Holdout. The third slash of Fel Claws steals 4% of maximum Health from enemy Heroes. Level 7 is a damage tier for Mal’Ganis, which means it is also a healing tier because of Vampiric Touch. More testing will be needed to determine which talent provides the most value and each seems nearly busted in their own right. Two standouts at the moment are Will of Tichondrius and Spreading Plague. Will of Tichondrius offers an early Giant Killer and massive burst healing, especially when combined with Time to Feed at Level 1. The amount of long term damage provided by Spreading Plague is considerable, particularly on maps like Infernal Shrines or Volskaya Foundry where it should be fairly easy to maintain its uptime. In the single target department, Black Claws provides a [/i]Follow Through[/i] style of gameplay that may be good for taking down the backline. When Mal'Ganis is healed, he gains 1% Movement Speed for 8 seconds, up to 15%. Level 13 improves Mal’Ganis’s ability to stick to the enemy. The increased sleep duration from Deep Sleep is marginal in comparison to what is already a long CC ability (2.5 seconds). However, the 10% increased movement speed for Night Rush makes the ability even more threatening as a chase tool. The Night Beckons is likely the go-to since the slow following Night Rush provides more utility for your team, but Blood Rush is very attractive as it will provide more static mobility bonus in a teamfight similar to Yrel’s Samaara’s Light. Necrotic Embrace unleashes a wave of bats in front of Mal'Ganis, dealing 85 damage. Level 16 is another damage tier and therefore another healing tier. Plague Bats adds more AoE burst damage/healing to Necrotic Embrace while Frenzied Assault benefits from the Basic Attack talents at levels 1, 7 and 20. Blind as a Bat is the most intriguing talent in this tier, removing the mana cost and cooldown of Fel Claws for six seconds, but losing vision. This allows Mal’Ganis to use roughly twelve casts of Fel Claws, amounting to four AoE stuns and a significant amount of healing on an 80 second cooldown. Much like Deckard’s Ancient Blessings this talent can be over-the-top powerful and it is fortunate that it has a long cooldown (unlike AB upon release). In a coordinated team environment where teammates can help lock down enemies and lead a blind Mal’Ganis to the right location, Blind as a Bat can be a true game-changing ability. It can also be used as an escape, as you can flail on repeat in one direction. On the flip side, it could be one of the most underperforming talents in unskilled hands. Enemy Heroes near the target suffer 75% of the transferred Health as damage over 3 seconds. Does not benefit from Vampiric Touch. Damage from Fel Claws and Basic Attacks Slows enemies by 15% for 1.5 seconds, and Vampiric Touch converts 10% more damage into healing versus Slowed Heroes. There doesn’t seem to be a bad talent in Mal’Ganis’s Level 20 tier. As a default, Vanquish the Weak provides a consistent damage and sustain increase, and has massive stacking synergy with each of the Basic Attack talents in the earlier tiers. Seeker Swarm and Wrath of Nathreza each provide their own form of wombo potential, but are tied to the 80 second cooldowns of their corresponding heroics. Alone in the Dark is a great end-game counter to the hyper-carry assassins in the current meta. Without live server testing, it is hard to picture Mal’Ganis operating as a true main tank outside of the Team Octalysis style double-support/double-bruiser compositions. As he scales into the late game, Mal’Ganis has the ability to stick to a target and disrupt both the front line and back line much like Yrel. From a first impression, he should be a powerful addition to the Nexus and very fun to play. Alright, we finally got some games in ptr on Mal'ganis and have to say, he's actually fine as a main tank. The hero has some weaknesses in both main tank and solo lane roles, but seems functional in both for now. What do you think about Mal'Ganis? Is he a solid tank or just another tanky solo laner like Blaze and Yrel? Will he be game-changing or just another pub hero? OP or not?